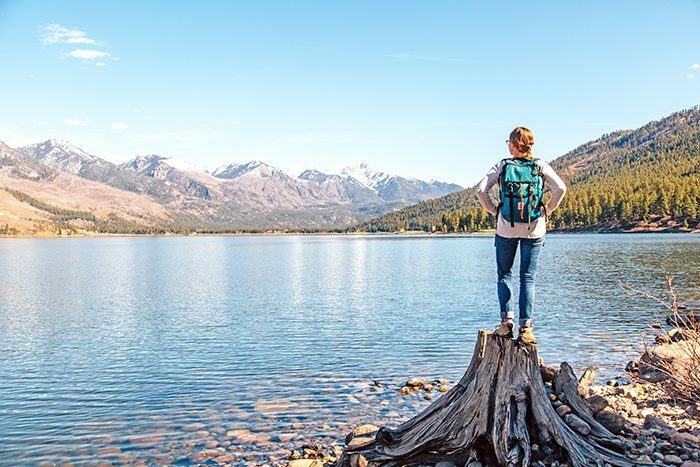 Last August, Megan McDuffie and Michael van Vliet quit their day jobs, loaded up their Ford Focus hatchback, and departed on a yearlong road trip to explore North America. 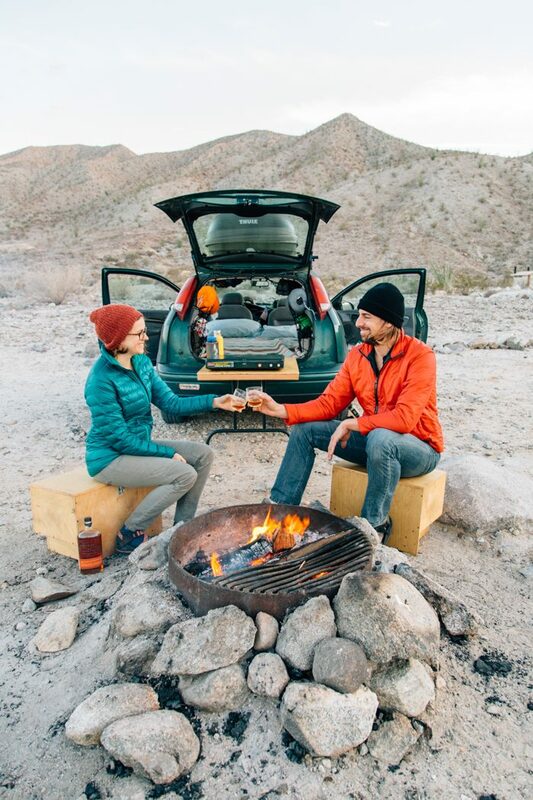 So if anyone is an expert at car-camping, it’s these two. I’ve been following along on Instagram—their photos are beautiful!—and asked them to contribute. I was thrilled when they agreed to share their tips for camp cooking. We love to travel, and this is definitely something I’d like to do more of! If any of you have tips to add, please do so in the comments! 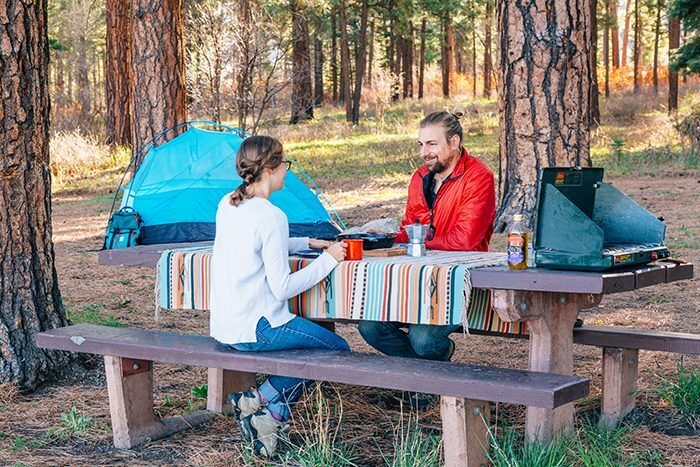 Spring is in the air and camping season is just around the bend. It’s time to start thinking about warm evenings playing cards outside, roasting marshmallows around a campfire, and lazy mornings sipping coffee in the great outdoors. We’ve been traveling across the US and Canada for the past nine months—camping nearly every day—and nobody is more excited about the arrival of summer than we are! During our extended road trip we started a camp cooking website called Fresh Off the Grid, a resource for camp-friendly recipes and outdoor travel inspiration. And after cooking over 500 meals in the outdoors, we’ve got a few ideas to help you up your camp cooking game this season. 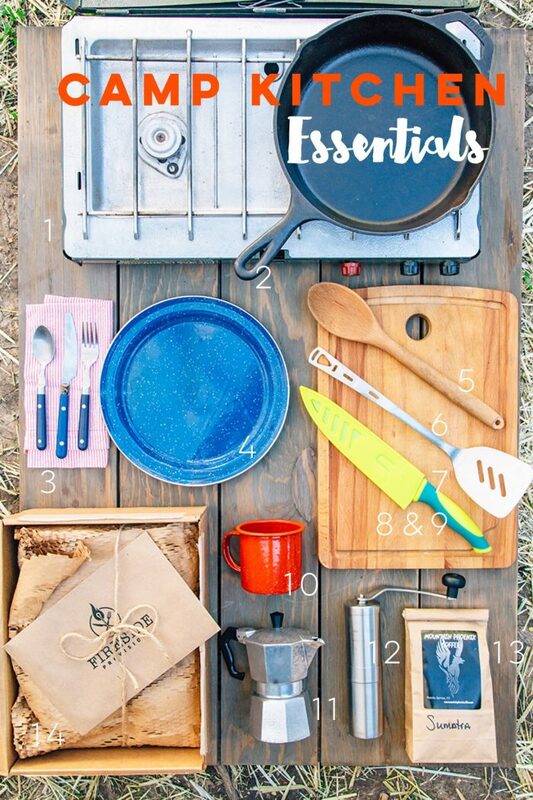 We put together a list of some useful items to incorporate into your camp kitchen and the reasons why we love them. And for a little inspiration, we’re sharing a recipe for a super simple breakfast hash to brighten up your morning. So, let’s get ready to go camping! Coleman Two-Burner Stove. The classic two-burner stove from Coleman has been a stalwart of camp cooking for generations. It’s time-tested, durable, and uses those green propane fuel canisters that can be found virtually everywhere. Lodge Cast Iron Skillet. 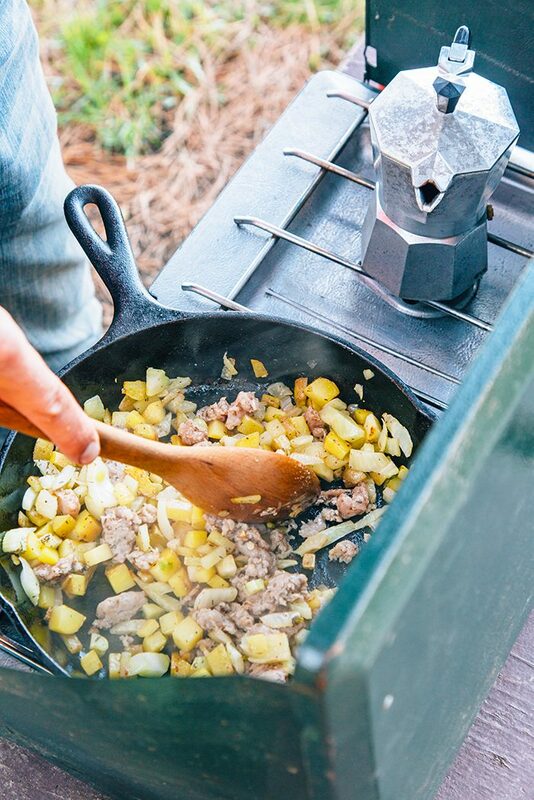 Our go-to pan for camping, a cast iron skillet can be endlessly re-seasoned, used on a camp stove as well as over an open fire, and easily cleaned. Enamel Silverware. These enamel handle forks, knives, and spoons are indispensable essentials. Enamel Plates. Leave the ceramicware at home, and pick up some tough-as-nails steel enamelware plates. Wooden Spoon. Perfect for stirring up chili or dishing out oatmeal. You can get by without a wooden serving spoon, but its presence is always missed. Spatula. Flip fried eggs, press bacon, and serve up flapjacks. A good spatula is a versatile camp cooking utensil. We prefer an all metal spatula, so it can be used on a grill or over an open fire. Tongs. (Not pictured.) If you’re cooking over an open fire, a pair of tongs are invaluable. Flip steaks and rotate corn, all without singeing your hand. Cutting Board. We’ve seen a lot of campground picnic tables over the course of our travels, and you do not want to prepare food on any of them. Bring along a small, portable cutting board, to make food prepping safe and sanitary. Enamel Mug. 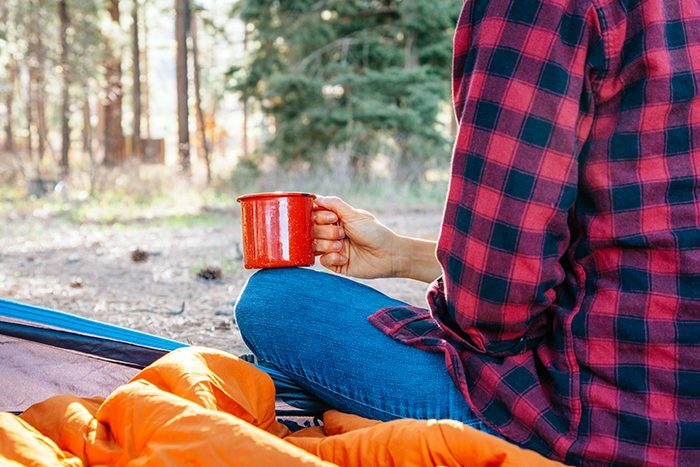 Everyone has a favorite coffee mug, but you need something that can hold up to the rough-and-tumble life of camping. A set of steel enamel mugs will not only hold up at the campsite, but survive the car ride back! Moka Pot. The MVP of the morning, a Moka stovetop coffee pot makes a nice, strong cup of coffee without the paper filters. Easy to set up, easy to reload, and dead simple to clean. Hand Grinder. For the freshest tasting coffee while camping, we grind our beans each morning with a hand grinder. To non-coffee people this might sound extravagant, but to self-identifying coffee snobs like ourselves, to do anything else is blasphemy. Bag of Coffee. Especially if you’re car camping, there’s no need to pre-ration coffee before you go. Bring the whole bag. With a cup of coffee in your hand, there’s nothing you can’t handle. 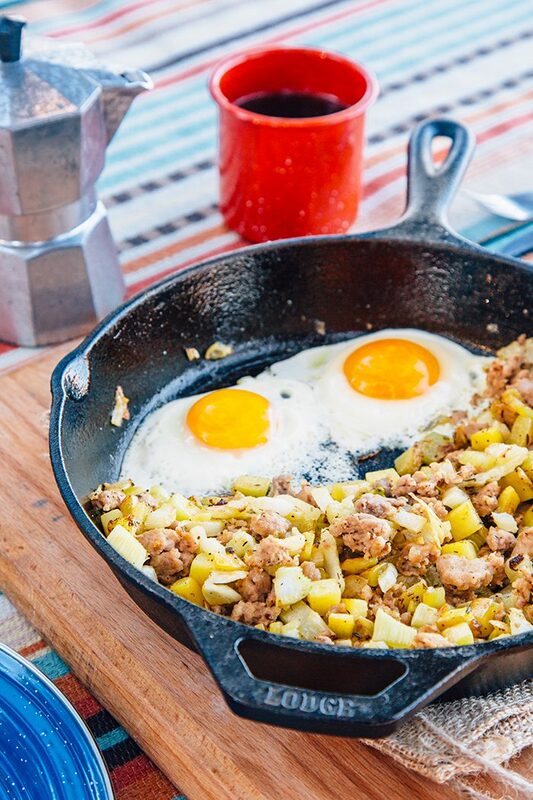 This fennel sausage hash is one of our favorite recipes we developed for Fireside Provisions. Like all good camping meals, it’s simple to make and easy to enjoy. 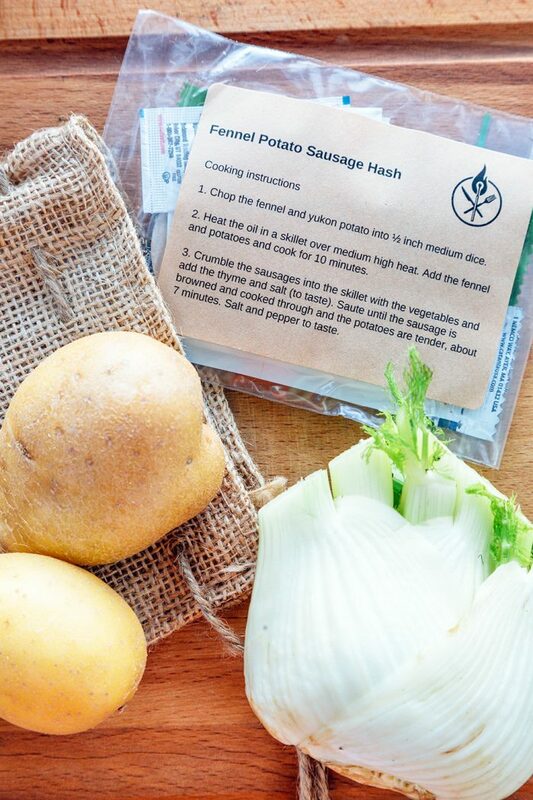 The potato & sausage is a familiar combination, but the addition of fennel and thyme elevates it to a whole new level. This recipe is the perfect way to expand the horizons of picky eaters and anyone else who prefers the breakfast “classics.” Drop in a couple of eggs and you’ll have a sunny-side up kind of morning. Tip: We prefer our eggs sunny side up and use a lid for our cast iron skillet in order to pull them off. Once the hash is almost ready, create a well and drop in your eggs. Reduce heat and cover with the lid. The heat from the pan will cook the eggs from the bottom and the trapped steam will cook them from the top. It takes about 2-3 minutes to cook the eggs so that the whites are firm, but the yolks are still runny. Thank you, Michael and Megan—Your journey is so inspiring, and you’ve seriously elevated my camp-cooking aspirations! Happy to learn some road-tested tips! P.S. Thru-hiking the Appalachian trail.